Rev. Andrew Eliot, a Connecticut Revolutionary War Spy, who exchanged particulars from Washington, Franklin, Hancock, and Jackson, with his co-spy father in Boston we might not be enjoying our present American freedom. Curiosity about the Revolutionary War letters Bernadine Fawcett inherited led her to discover intimate accounts of a Patriot Spy Ring. Now as a great grandmother, Bernadine Fawcett, B.A. G.S.S (Fordham University) Counselor, Columnist, Author, Television and Radio Personality realizes the importance of sharing her research which ties her to the family of Vice President Aaron Burr. His obscure relatives Rev. Eliot, whose wife was a direct line descendent from Alfred the Great as was Aaron Burr, and Burr’s first cousin, Thaddeus Burr, exchanged firsthand secret information dealing with Gen. Washington and other troop developments which was delivered (on occasion by John Hancock) to the elder reverend of the same name in Boston. 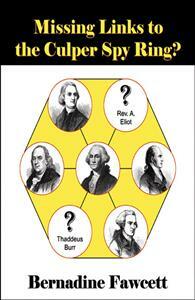 Bernadine Fawcett's new book, Missing Links to the Culper Spy Ring?, is a fascinating read. Not only does she make a solid argument for her premise that Rev. Andrew Eliot of Connecticut and his father the Rev. Andrew Eliot of Boston were indeed part of the famed Culper Spy Ring, her inclusion of the actual letters sent from son to father depict the actual day to day life of an early American family dealing with the tumultuous events of the American Revolution. Whether or not you are convinced by the main argument offered by the author, the letters alone will be well worth a reading of this book, as they bring to life a turbulent time in American history as only a primary source can. Stephaine Bail, President of the Wading River Historical Society, Editor of the newspaper, THE SOUND OBSERVER. THIS BOOK WAS VERY INTRIGUING.I LOVED HEARING THROUGH A FIRST HAND OBSERVER THE ROAR OF THE CANNONS.ITS AMAZING THE BRAVERY THAT THE WOMAN EXHIBITED! !WOULD ANY OF US TODAY TRUELY PUT OUR FAMILES AT SUCH A RISK? THIS IS AN UNPARELLED LOOK IN THE PAST.ITS A MUST READ!!! !